I'm not sure I even want to speculate about this. I think this has the answer!!! Keoghan said he was terrified by the latest challenge he set himself, proving he was not completely fearless. "I was on a celebrity game show the other day and it scared the hell out of me," he said. "I was under pressure when everybody knows what the answer is and you're standing there with the clock ticking. "It was one of the most horrifying, scary things I've done. But I did it." Standing next to Julie Chen can be quite scary. I'm sure Phil would be only too happy to make a guest appearance but I promise that, for logistical reasons, it won't happen in series 3. I've never written about Phil before but he is a top guy and great to be with on the road. We've spent many hours chatting (usually at airports) and he loves TAR. Funnily enough, behind the scenes, Allan reminds me of Phil (similar sense of humour) and they are both genuinely nice guys. I think they would get on famously. I would love to see Phil on the mat in TARA 3 with Allan as a greeter in New Zealand. How great would that be? a friend online knew how much i adored Phil and as a surprise, had him send me an autographed pic. Where are you going Phil Whatsisname, the host of The Amazing Race! and while there--make a kid's day! 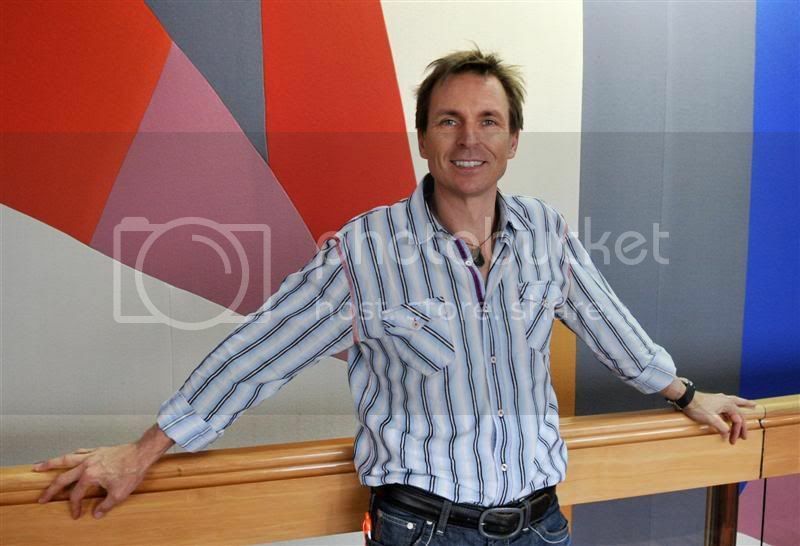 1) Arrange for the host of the Amazing Race TV show, Phil Keoghan to stay at your hotel. Just when the crankies were about to set in as we packed ourselves like sardines into the hotel shuttle bus to endure the long flight home, who shows up but TV host Phil Keoghan from the Amazing Race. I couldn’t have planned things any better if I had slipped his agent $1000. He stood around outside our van, chatting to his driver…and my daughter got take it all in within eight feet. I am now officially a hero for having taken her to Philadelphia. Wait till all her friends hear about this on Facebook! Since 2001, "Amazing Race" host Phil Keoghan, 41, has traveled the circumference of the world 80 times, has been to more than 100 countries, has been held by Ukrainian immigration overnight because he didn't have the right papers and washed his hair on the side of the road in China. Keoghan (pronounced KOH-gahn), a New Zealand native who lives in Los Angeles with his wife and daughter, begins his 13th season with "Race" tonight on CBS. How many frequent-flier miles do you have? I have three accounts with about half a million each. But I use my miles all the time. As fast as I fill them up, I'm using them. I always travel with earplugs, an eye mask, noise-canceling headphones and my iPod. I always travel with my computer, a good book, a journal, some Sudoku and movies. . . . I really enjoy traveling because of the opportunity to escape communication. . . . I'm dreading that there may come a time when people are going to be allowed to use cellphones on planes. I think it's absolutely insane. How do you think you'd do as one of the racers? I have absolutely no desire to race around the world for a million dollars. It's not on my list of things to do before I die. . . . I enjoy watching these racers go around the world because I think it's unique for them. I like watching what they do and their reactions. I don't really want to subject myself to being under a microscope for 30-something days. One of the things "The Amazing Race" is known for is its pretty challenging detours and roadblocks. Are these activities selected because of a certain fear a racer may have? There have certainly been times -- because we know going into the race what people are afraid of -- where they end up facing those fears. But to me the best challenges are not necessarily things like bungee-jumping but the more indigenous challenges. Milking a camel, for instance. Pretty much all us can go bungee jumping somewhere. It's more predictable than finding out what happens when you take a bunch of Americans to Africa and ask them to milk a camel. That's so out there and so different that to me, the reactions, the television moments, are inherently more interesting. big philly styles is the man. Check out Phil and a sneak peek of his Dad tomorrow on the Bonnie Hunt Show! Times vary, so set your DVR's !! Phil talks about his dad being on the show this Sunday, the teams come in and dad says "Hi". They actually talked about the teams coming to his parents house for sconce and tea but the route did not allow them to go that way. So they came up with the idea of having his dad on the show, it was his Bday. commercial and when they come back Bonnie says how great it is to meet Phil, Phil talks about his browsie, Bonnie shows Phil's book, they talk about the book, Phil's near death experience etc facing fears. Phil says he hosted a show where he was naked for 3 days in a nudist colony!! The 13th season of The Amazing Race sends host Phil Keoghan to his homeland. And on Sunday night, viewers will see his father serving as the official greeter at the end of this leg. "It was one of those moments in your life when you realize that it doesn't get much better than that," Keoghan tells CTV.ca. He was thrilled to see his father standing on the mat. "I would never imagine in a million years he and I would be standing there." 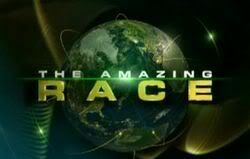 On "The Amazing Race" teams tackle absurd challenges as they race around the world for their chance at a US$1 million prize. At the end of each episode, teams land on a mat at the finish line, where they are welcomed by a local greeter, then informed by Keoghan how they rated in the race. The episode, entitled "I Wonder If They Like Blondes in New Zealand?" sees the racers leave South America for a whole new adventure on the other side of the world. Keoghan, who also serves as a producer on The Amazing Race, personally scouted the show's route through the country. This is the show's third visit to the area and Keoghan knew that this time around he had to invite his father to be on the show. "I've taken him on a number of adventures, and when I asked him, he couldn't get on a plane fast enough to get up there and be a part of it," says the host. Last week self-professed geeks Mark Yturralde and Bill Kahler were eliminated in Bolivia. "The Amazing Race," which won the Emmy for Outstanding Reality Competition for the sixth year in a row, airs Sunday nights on CTV. Phil's Dad is a Hit!! Phil regretfully told them they were eliminated from the race but all was not lost as Phil’s dad offered them a big bear hug. He’s what this show needs. Now only if they would take him along to each and every pit stop and dress him up in that country’s native clothing. I can see him now in a matador costume saying, “Bienvenido a Espana. Soy el padre de Phil!” and wearing a beret with a greeting of “Bienvenue en France! Je suis le père de Phil!” One can never have enough Keoghan. Heeee...I don't know about the dining but for the TRAVEL!! The Awards will be given Nov. 16th 2008 at the Beverly Hilton in Beverly Hills, home of the Golden Globe Awards. Chris talks to the multi emmy award winning presenter and director of the US reality show The Amazing Race. So as of 10/26 he was in LA still....so not racing yet! So it would seem peach although a picture of Phil at the event would have been cherry. I'm glad he didn't get tempted to shave his head!